When using the High Dynamic Range (HDR) feature of the Camera app, a normal non-HDR copy, will saved in addition to the HDR pic. This will result in a second picture for every photo you take with HDR turned on consuming twice the amount of storage. Additionally, your photo album will become cluttered with non-HDR copies. If you manually turn on the HDR feature, iOS should only save an HDR picture. The good news is that the annoying default behavior can be disabled. Trying to find high quality paid apps when the price drops to free can be difficult. Some paid apps never go free. 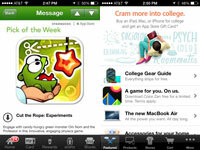 Your best bet to find a quality paid app for free is through promotional giveaways. There are a growing number of sources giving away paid apps. But where should you look?